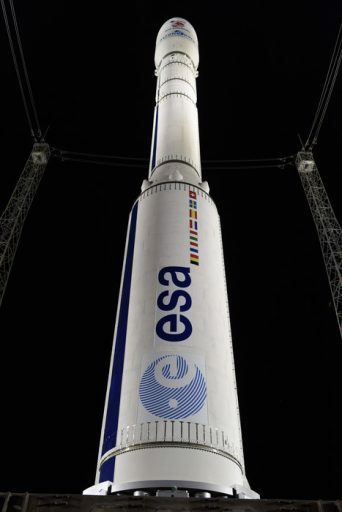 Europe’s Vega rocket has been cleared for a nighttime liftoff from the Guiana Space Center Thursday night, carrying into orbit the first high-resolution Earth-imaging satellite for Peru plus four small-sized Earth observation satellites operated by Google subsidiary Terra Bella. 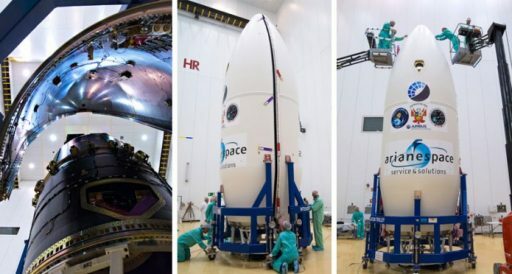 The light-lifter in Europe’s rocket family operated from French Guiana is set for liftoff at precisely 1:43:35 UTC on Friday, 10:43 p.m. local time at the spaceport. Employing three powerful solid rocket motors and re-startable upper stage, Vega will reach orbit 14 minutes after liftoff, but the orbital ballet required to deliver the five satellites to their precisely planned orbits will take another hour and a half. PeruSat-1 is the first high-resolution Earth observation satellite operated by the government of Peru to generate data products to be put to use in a variety of areas including agriculture, urban planning, border control, humanitarian aid, disaster monitoring and the fight against drug trafficking. 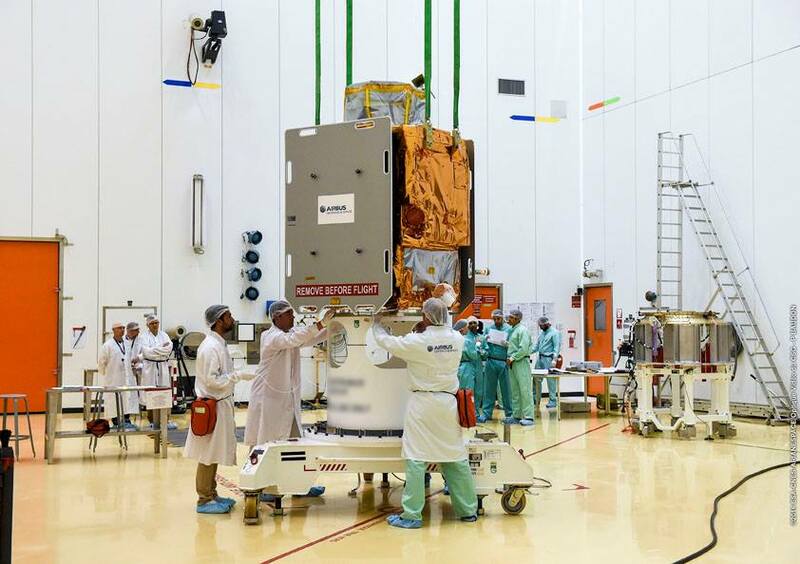 The 430-Kilogram satellite was built by Airbus Defence and Space in less than 24 months from the contract award to the delivery of the satellite – showcasing the company’s new “Projects Factory” that takes a streamlined approach to small satellite construction based on modular platform and instrument components. PeruSat-1 is the first satellite based on the AstroBus-S platform to take flight, hosting an agile pointing system and avionics chain adapted from previous Airbus & CNES designs. PeruSat-1 carries a variation of the NAOMI payload, the New AstroBus Optical Modular Instrument – a 65-centimeter telescope feeding a multispectral detector system to generate panchromatic imagery at a ground resolution of 0.7 meters and color plus near infrared imagery at a two-meter resolution. 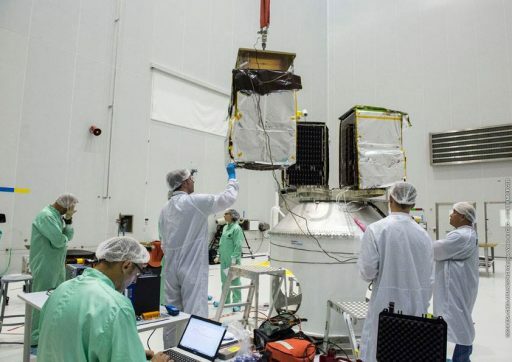 The Peruvian satellite shares its ride to space with four SkySat Second Generation satellites built by Space Systems/Loral and operated by Terra Bella as part of a large constellation of imaging craft that is currently being deployed. 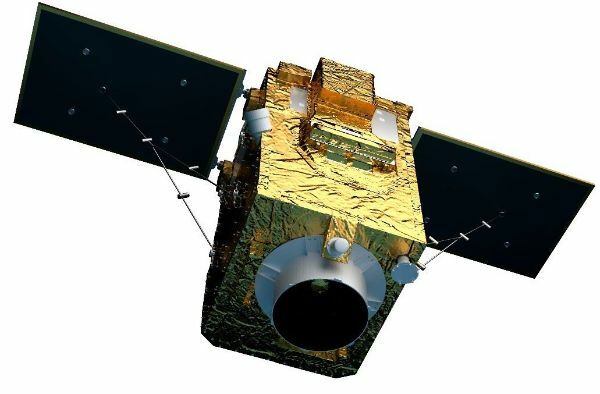 Each of the 110-Kilogram satellites hosts a 3.6-meter focal length telescope and CMOS detector array capturing video and still images in the panchromatic band at a maximum ground resolution of 0.9 meters and 2.0 meters for color/IR imagery. Capturing video, the SkySat craft can stay on one target for a minute and a half by slewing the satellite to compensate for its orbital motion. 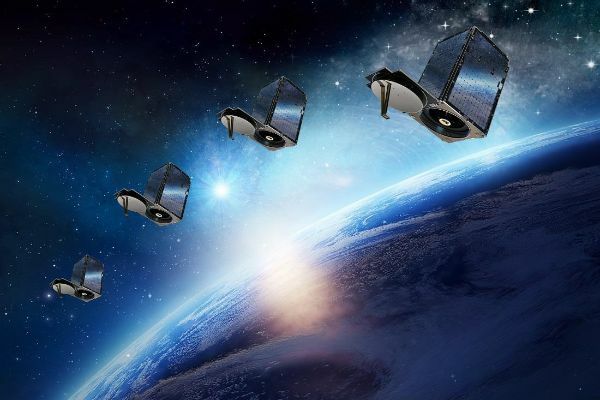 Terra Bella plans to launch 19 SkySat constellation spacecraft with options for another six. A pair of prototypes went into orbit in 2013 and ’14 and were followed by the first Gen2 satellite in June 2016, lifted by an Indian PSLV rocket. Six more are set for a 2017 liftoff onboard a Minotaur-C rocket. 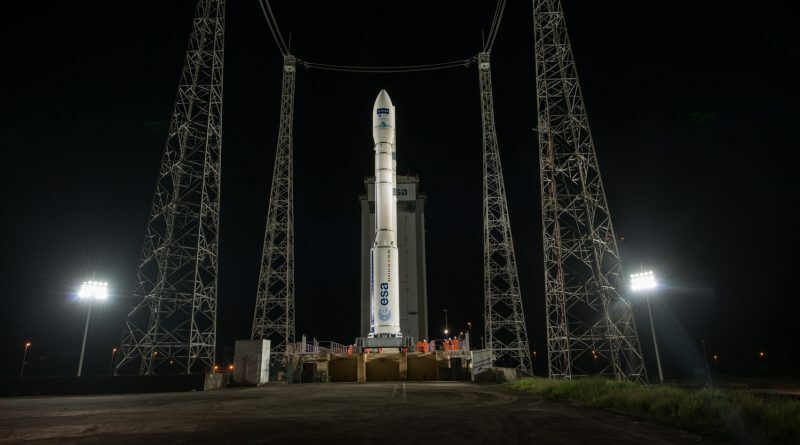 Vega’s seventh launch campaign kicked off at the Guiana Space Center in early 2016 when the components of the rocket arrived at the space base. 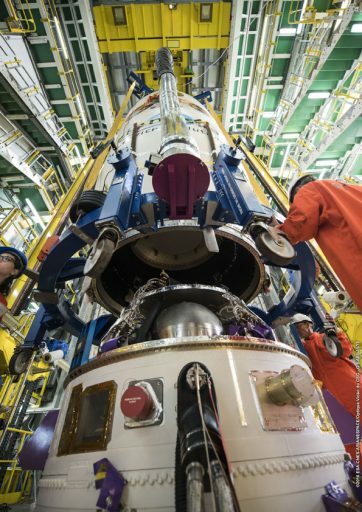 Stacking of the three solid rocket stages was completed in June when the mission was still working to a launch date in July which would ultimately slip to September due to payload-related delays. PeruSat-1 arrived at the launch site in early August to undergo final checkouts and propellant loading for its multi-year flight with the four SkySats also going through the same tasks before being integrated on their payload dispenser. While the four SkySat spacecraft ride side by side on their adapter, PeruSat-1 will make its way into orbit below them, hidden under the jettisonable adapter system known as Vega Secondary Payload Adapter. The integrated payload was encapsulated in the protective payload fairing on September 1 followed by its installation atop the rocket’s upper stage last week. A series of checkouts and launch rehearsals were performed in the week leading up to launch and mission managers convened for the Launch Readiness Review on Wednesday, clearing Vega for its nighttime liftoff. The 30-meter tall rocket heads into its countdown seven hours prior to the expected launch time. As an all-solid launcher with an upper module fueled by storable propellants, Vega’s countdown does not include any dynamic events such as propellant loading. Over the course of several hours, Vega’s systems will be powered up for a series of communication and guidance system checks. The Mobile Service Gantry will be pulled back at T-2 hours and 40 minutes followed by a row of confirmation checks with the ground stations needed by the mission. Inside one hour, the launch team will make final reconfigurations to prepare the launcher for the Synchronized Countdown Sequence before reaching T-34 minutes. 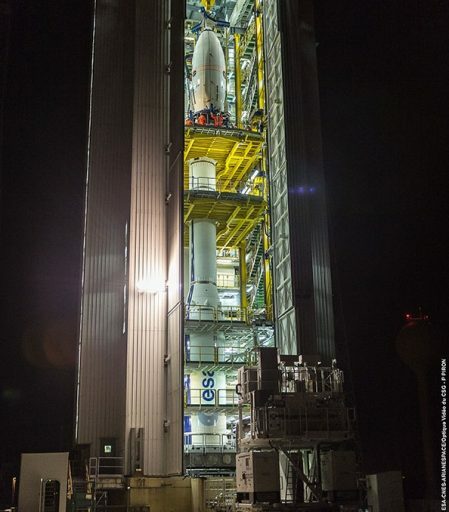 Provided all stations are GREEN and the satellites are ready, the countdown will enter its Synchronized Sequence – a highly choreographed procedure that includes the final steps that are necessary to configure Vega for liftoff. During these final four minutes, the launcher transfers to battery power, as does the Flight Termination System that is armed for launch around T-3 minutes. Vega will complete a Thrust Vector Control check of its first stage and the Flight Control System will transition to launch mode before Vega is handed control of the countdown in the final seconds leading to blastoff. Upon Ignition of its P80 first stage, Vega will literally jump off the ground – generating a total thrust of 280,000 Kilogram-force to lift the 137-metric-ton vehicle. Seconds after lifting off, Vega will pitch over to begin flying to the north, aiming for a Sun Synchronous Insertion. The 11.2-meter long first stage will burn over 88 metric tons of solid propellant in just 110 seconds, accelerating the rocket to a speed of 1.8 Kilometers per second. Burnout on the first stage is sensed by the declining chamber pressure, triggering the pyrotechnic stage separation sequence at T+1:54 to set up for the ignition of the second stage, designated Zefiro-23. The Z23, loaded with 24 metric tons of packed propellant, will soar to an average thrust of 122 metric-ton-force for a burn of 77 seconds. Separation of the 8.4-meter second stage is expected at an altitude of 121 Kilometers at a speed close to four Kilometers per second. Ignition of the Zefiro-9 stage comes around 20 seconds after Z23 separation at T+3:38. Although it is the smallest of the three stages, Z9 has the longest burn time – firing for 120 seconds at an average thrust of 23 metric-ton force. The protective payload fairing will split open and separate four minutes and four seconds into the flight when Vega will be well on its way out of the dense layers of the atmosphere. Stage 3 accelerates the vehicle to 7.6 Kilometers per second and separates six minutes and 49 seconds after launch when the vehicle will have reached 184 Kilometers in altitude. At that point, the AVUM – Attitude and Vernier Upper Module – assumes control of the flight, first tasked with stabilizing its orientation before coasting uphill for a little over a minute. The AVUM will ignite its RD-869 engine at T+8 minutes on a burn of just over six minutes to push the stack into orbit with a thrust of 250 Kilogram-force. Arriving in an elliptical Parking Orbit, the stack will have to coast so that the second AVUM burn, set for T+38 minutes, can deliver the stack into a circular orbit. The 89-second firing of the upper stage aims for an orbit of 491 by 508 Kilometers, inclined 97.4 degrees. Less than one minute after the completion of the burn, a quick series of commands will be sent to one-by-one separate the four SkySat spacecraft in a period of just seven seconds, being pushed into opposite directions to avoid any contact after deployment. Setting out to boost PeruSat-1 into a higher orbit, AVUM will perform a pair of burns, 47 and 45 seconds in duration at T+54 and T+101 minutes. These maneuvers will set up for spacecraft separation one hour and 43 minutes after launch into an orbit of 667 by 684 Kilometers at an inclination of 98.2 degrees. When PeruSat-1 is sent on its way at AVUM will quickly retreat before re-lighting its engine at T+1 hour and 52 minutes for a retrograde burn of only 15 seconds that will be sufficient to put the vehicle on course to a destructive re-entry. Copyright © 2019 Vega VV07 | Spaceflight101. All rights reserved.